Tires on any vehicle are very important. It is where the rubber meets the road. Bike tire pressure is a very important facto. Depend on where you are riding and what type of tires are on your Electric bike will determine a optimal tire pressure for your bike. If you are like me and have a new fat tire E-bike, you are a little confused about the proper tire pressure to use. Unfortunately, unlike on your car's recommended tire pressure, fat tire bikes air pressure can vary significantly. This post Fat Tire Pressure Guide for An E-bike is here to help you understand what the right tire pressure is for you. There are many variables to decide on the best bike tire pressure for a fat tire E-bike. Generally, fat-tire E-bike riders use pressures at around 8 PSI for soft conditions or even a little lower in snow and sand. 12-15 PSI is good for trail riding and 20 PSI for on-road or urban riding. Other factors like the type of bike, weight of the rider, personal preference and a number of other variables will also determine a good tire pressure to use. 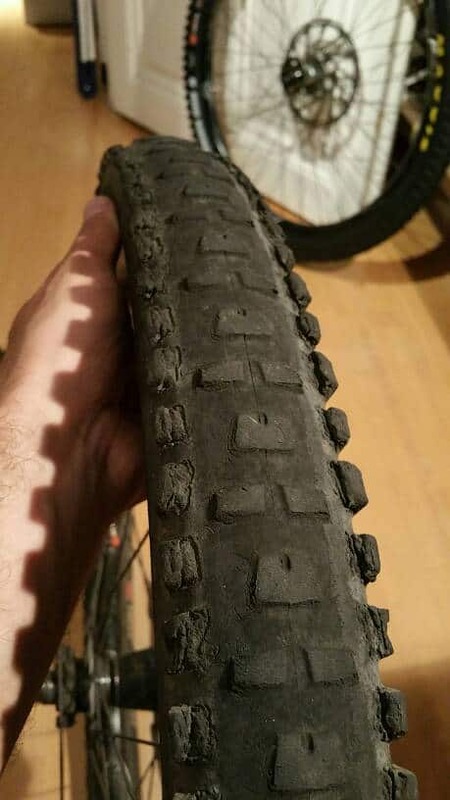 I recently posted the question on a few E-bike Facebook groups, "What is the best bike tire pressure for your fat tire E-bike and how does it affect your battery life.?" I quickly learned that there are too many variables to get one definitive answer. 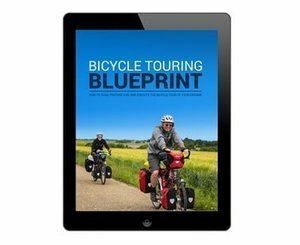 Some of the variables to consider are what type of bike you are riding. Is it a full suspension or a hardtail bike? How much do you weigh? Weather conditions, how fast are you going and what kind of terrain are you riding on. The make of tire and what is the tire made from are also factors to consider. Personal preference and a number of other factors will also determine the correct tire pressure for your Electric bike. 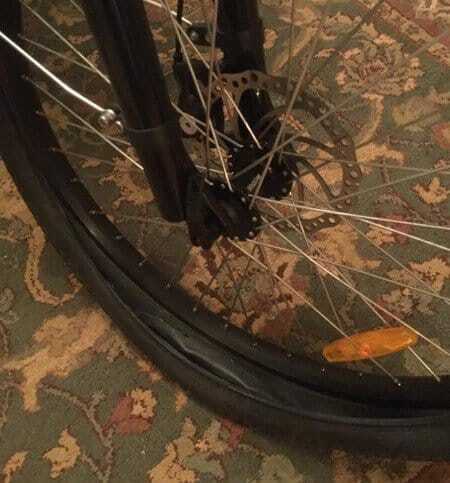 The following post, Fat Tire Pressure Guide for An E-bike will give you a good overview of fat bike tire pressure and the many variables that will determine the right air pressure for your needs. Also included is input from a number active riders on what tire pressure they use. Compared to a regular fat tire bike, there are a few more things to consider with a fat Tire E-bike. A pound or two of pressure up or down can make a big difference. Fat Tires have a large volume of air and a difference of just a 1 or 2 PSI will make a noticeable difference in how the tire feel and act in various terrain. Lower tire pressure with a regular bike can increased drag resistance and cause you to work more but on an E-bike increase drag also will reduce battery range. Better battery range. Higher tire pressure causes less friction on pavement and flat terrain. This therefore creates less drag and less power is needed from the motor. Good for flat smooth terrain. Urban commuters generally run at a higher tire pressure. More rigid ride. You will feel the bumps more. Less grip on loose gravel. Less rubber in contact with road. Can significantly reduce range. More drag therefore more power required from the motor and battery. Air temperature dramatically affects your tire pressure. As recommended you ideally should be storing your E-bike indoors during freezing temperatures or at the very least you should not let your battery freeze. See my post on How to properly store your e-bike for winter for recommendations. If you put 10 psi in your tires at home and then go ride in minus 20 your tire pressure will easily drop by half within 15 minutes of riding. 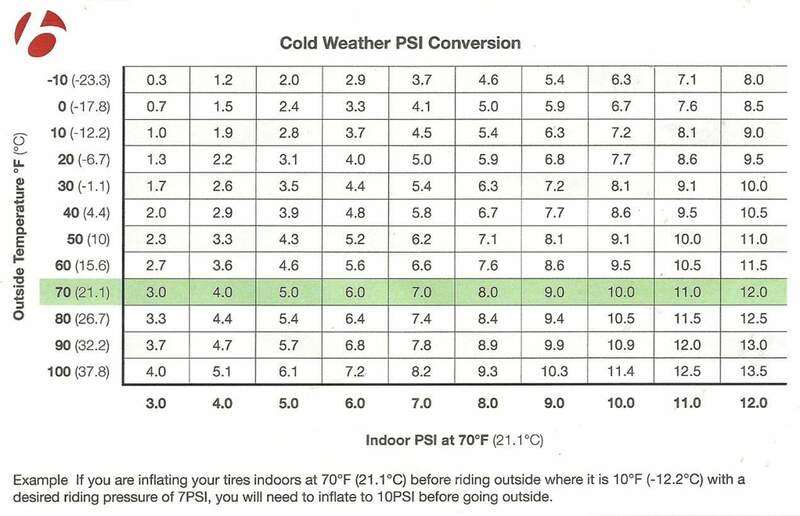 Here is a conversion chart by Bontrager to help you understand the effects of temperatures on your tires when you go from warm to cold. The cheap tire gauge you use for your car will not cut it for a Fat Tire E-bike especially when you are down below 10 psi. Car tire pressure is general 30 psi and up and cheap tire gauges have a coarse scale that is not sensitive enough to indicate a pound or two change. I highly recommend this tire gauge that is relatively inexpensive the Jaco ElitePro Tire pressure Gauge available from Amazon.com. It will show you pressure change down to the half pound. Should Your Front and Rear Tire Pressure Be Different? This again can be a personal preference. Generally, people will put more air in the rear tire because most of the weight is often sitting on the back tire. Lower pressure in the front will also give you better traction and absorb some of the bumps. If you are unlucky and ride on rough terrain often you may get many flats. Some people can go hundreds of miles before getting a flat whereas other people get flats often. A good quality tubeless tire is a good option that is recommended by many cyclists. You will need to change the stems to No Tube Valve Stems available from Amazon.com to go tubeless. Another preventive is to put orange or green slime inside the tire available at Amazon.com. Although it can be messy when you do have to repair or change a tire, this product will definitely prevent a number of flat tires. Correct tire pressure for the type of terrain also can help. Too high can increase the chance of a puncture and too low and the tire can get pinched by the rim. A tire liner can also be used. This is a strip of extruded plastic that sits between the tire and the tube. This is relatively inexpensive, easy to install, and will greatly reduce punctures like glass, thorns or other sharp objects from reaching the tire tube. Mr. Tuffy Bicycle tire liner available at Amazon is guaranteed to prevent punctures and has many positive reviews to back that claim. Fat Tire bikes have only been around since the late 90s. The first fat tire bike builders were in Alaska and wanted a bike to go in the snow. Some of the first fat tire bikes used two rims and welded them together and then took two tires and stitched them together to make them 4” wide. In 2005 the first production level fat tire bike was made by the manufacturer Surly and called it the Pugsley. 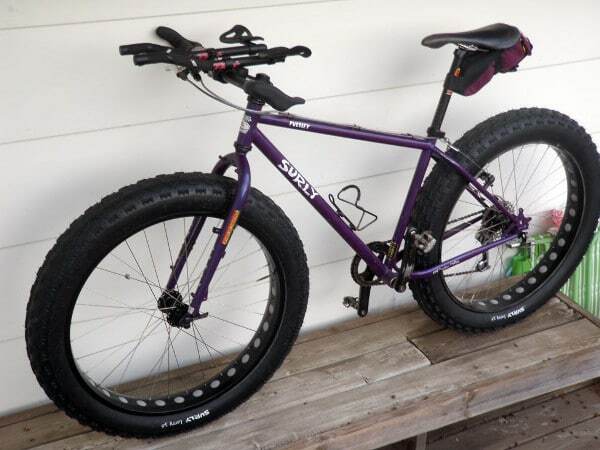 First Manufactures Fat Tire Bike made by Surly and called the Pugsley. After 2005 Fat tire selection was still limited for a number of years but in the last 10 years with more fat tire bike available there are now a number of new Fat tires available that range in price from $35 up to around $150 for high end tires or studded tires. The Kenda Juggernaut Pros available from Amazon.com are very popular tire that is Kenda's top of the line tire. Choosing the right thread count can be a little confusing. Most think the higher the thread count the better the tire. This can be true for tires that are mostly used on the road but for off-road mountain bikers, this is not the case. A higher TPI tire is more prone to punctures than a lower TPI tire that is usually fatter and made with less-penetrable fibers. A higher thread count creates a more agile ride on road surfaces. The type of tire and thread count can make a big difference on the handling and range of your E-bike. This is especially true with road tires where tire pressure is higher. A higher thread count can allow the tire to be made of lighter materials and give the rider a more comfortable ride. A higher TPI on a tire is generally thinner and more flexible than a tire with a lower TPI. High TPI tires have a thinner wall, are lighter and have less rolling resistance. Rolling resistance on an E-bike can greatly affect the range of your battery. But higher TPI tires can be more easily damaged by road hazards. Thread count can vary from as low as 20 TPI and go up to 320 TPI for high-performance tires used in racing. Most all-purpose mountain bike tires made today have somewhere around 50 to 70 threads per inch. This is a good compromise for durability and handling. A good set of new tires on a bike can make it feel almost brand new again. Unlike car tires that have a mileage rating that is reasonably accurate, a bike tires lifespan can vary greatly. It can depend on the type of tire, how much you use the brakes, the type of terrain you ride on and the tire pressure used. Tires will wear faster on asphalt than on snow. Generally, the back tire will wear out faster than the front tire. Many people will take the front tire and use it on the back to get the most out of their tires. A good practice is to rotate the tires every 500 to 1000 miles. The age of the tire and how it was stored will also affect tire performance. A tire that is a few years old will be more brittle than a new tire and will be prone to crack more easily. The tire won't hold air for very long is punctured or broken down so much they leak from everywhere. Side knobs are worn. This will compromise the bikes turning ability and cause more skidding around corners. The center thread is worn out. This happens faster when tires are overinflated. Traction when braking is compromised. You will notice the rear tire will do more skidding as it gets more worn. A visual inspection of your tires will tell you a lot. You will notice cuts into the cording, lugs tearing away, cracks on the side walls. Below is a good example of a well worn tire that is time to replace. Here is some feedback from active riders and what tire pressure they use. I have a Rad and run 25 pounds. Great battery life get 40+ miles easily. I ride mostly paved roads with some trails thrown in. It all depends on surface that you riding on and your weight. If it’s a hard pack then higher pressure is fine (20 psi is too high even for summer riding), on soft snow/sand or mud sometimes even 2 psi will be necessary. I’ll run anywhere between 1.5-4 psi depending on conditions. For reference, I’m on a fully rigid bike, weigh ~230 geared up, run Bud/Lou tires (4.8″) on 100mm wide rims, and have never pinch flatted. I’ve been running about 8 or 9 lbs for a wet, slick snow. This seems to give me about the smoothest ride and great bite. Anything more and I start losing grip. Used to run between 20 and 25 on mostly paved. Went down to 15 after noticing wear on the center of the tire only. Rotated tires at about 750 miles. Stock Kendas. I do off road mostly, very low pressures (don't register on cheap gauges 6-8 lbs), I get a 1 bar less when I get home after a 20 mile, then on roads same mileage at higher pressures BTW high pressure not working in the desert off road, slip and slide all over, no grip. Usually pas 2-3 off road, 2 - 3 on road depending on wind =) ..
Also the distance on the battery continues to be outstanding even after 1500 miles. Never really ride more than 25 miles but always have at least 2 bars left 40% ? I would say that there are too many variables in order to get a gauge of what the tyre pressures should be. Type of bike, full suspension or hardtail, rider weight, type of terrain, speed, weather conditions, tyre make, tyre compound, and probably much more beside. On my Plus size hardtail with 2.8 Nobby Nics in Addix Speedgrip compound I run 14psi front and 16psi rear. I weigh 75kg and those pressures are for muddy rooted terrain and stream beds with an average speed versus ride length of just 7mph -10mph Those tire pressure still work for me within the 10 mph-20 mph speeds, but get unstable after that. On my Plus size hardtail with 2.8 Nobby Nics in Addix Speedgrip compound I run 14psi front and 16psi rear. I weigh 75kg and those pressures are for muddy rooted terrain and stream beds with an average speed versus ride length of just 7mph -10mph Those tire pressure still work for me within the 10mph-20 mph speeds, but get unstable after that. Have been riding a Fat bike for 3 winters now. Most of the guys I ride with run 5.5-7 psi in the rear, 5-7 psi in the front. Never any issues with cold weather and tires, but we usually do not ride when the temperature drops below -18C (0F). The lower pressure allows the tires to sit more square for better traction and provides some “suspension”. Nobody has ever had a pinch flat and one guys rides with 4-5psi in the rear and he is about 190 lbs. The bigger problem is getting the tire pressure set up right. If you keep you bike in a warm place and fill up the tires, when you ride the pressure may go down a lot. Good old high school chemistry and the Ideal Gas law. For example, if you fill up in the house at 70F to 6 psi, at a 0F ride the pressure will end up closer to 3 psi. So best to check your tire pressures when they are cold. The odd thing is that on my normal hardtail mtb, I run 16psi front and 18psi rear. No sense at all really, given that the eMTB is 7 kg heavier. It just feels better that way for some reason. I use some PSI the # is useless, different gauge = different result. The rule is simple where the tire touches the ground it should deform a bit, not be perfectly round. The cold lowers the pressure so if you use a warm garage you want hard tires let say 11 PSI after 10 min it might be 7 and if a small deformation is not enough grip you let out a bit of air to improve grip. You will know using your thumbs no need to buy/carry a gage. If the trail is soft do not use hard tires that will damage the trail, look at the trace you leave. G'day Pete! I'm running Kenda Juggernauts at around 20-25 psi. 5 psi for Jumbo Jim 4.00x26 for most grip in steep slope and comfort in rocks garden. Low speed required . As you can see that proper tire pressure for a fat tire bike is not a cut and dry answer. There are many variables. Stay within the suggested guidelines of the tire and experiment with tire pressures that you like the best. The old squeezing the tire with your hand method can work if you are very familiar with your tires, but it won't be very accurate. Getting a good pressure gauge is a great idea. This will allow you to adjust and read changes up to a half pound or you will just be guessing. Please comment and share your experience and tire pressure preference.